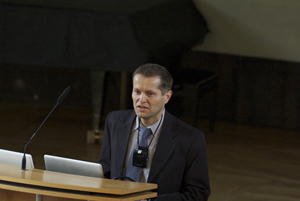 A central role in the endeavour of the International Max Planck Research School is played by a seminar program and a visiting researchers' program. In particular, students should be involved in selecting speakers for the seminar. We will ensure that there is a vivid exchange of ideas and an open atmosphere of discussion across the various groups involved. This will be enhanced by having an annual meeting at a venue outside the participating institutions. Interdisciplinary meetings and symposia enable the IMPRS-APS students to significantly broaden their horizon. The explanation of their research to e.g. biologists from the IMPRS for Molecular and Cellular Life Sciences and vice versa during an event that took place in July 2009 and that was co-organized by students from both IMPRS helps them to see links between the different science disciplines and to gain new perspectives. In addition, the interaction between the various IMPRS from the greater Munich area and Erlangen gives an important forum for information and experience exchange among the students. These coorganized events also provide a forum for such exchange between the group leaders and IMPRS coordinators. Since 2008 the symposium series New Frontiers in Science enabled students from each participating IMPRS to listen to talks and participate in discussions with world-leading scientists in astronomy, biology, laser physics, chemistry and other disciplines.